Coffee is energy, and according to the explanation of my physic teacher even if I used to be a social student, energy can't be created or destroyed but it can be converted from one form to another. According to my interpretation, let's say this energy named 'coffee' is an energy which can be converted to the form of concentration, focus, passion, and life. It's funny how drinks can improve our intellectuality, right? It's not an alcohol by the way, it's caffeine. We'll not be drunk and fall asleep then woke up on the bed next morning with someone naked next to us, but we'll be very concentrate in doing all of our assignments then woke up on the bed next morning and realizing that we have all our work done. Marvelous, marvelous. I need to admit if I've an addiction on this drink. At first, one coffee a day is enough, but it was. Then used to be 2 coffees per day and now 3 coffees per day. I dont know, 3 coffees per day, 90 coffees per month, 1080 coffees per year is safe to be consumed or it would be a frightening side effect. What matters is I enjoyed it, 90 coffees per month. I would like to elaborate this coffee session into 3 sections: morning, afternoon, night (optional). Morning is the most perfect time to drink our coffee. 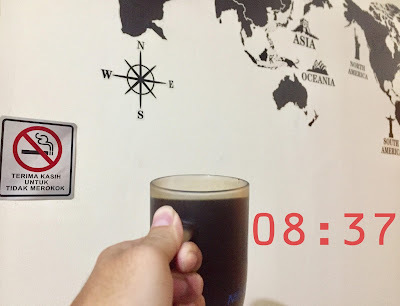 I don't have to drink it as soon as I waking up, maybe 30 minutes after waking up if I don't have a morning lecture. Because the problem is, according to experts, it's not healthy to consume coffee on an empty stomach, so looking for snacks first could be the wisest way. One of the most fun moments of my life is awaken from sleep and realize if it's already morning, the most perfect time to drink my coffee. I ususally enjoying coffee in the morning in my room, when the cold air of the air conditioner that has just been turned off can still be felt, my coffee just heat me up. I'm a #TeamHotCoffee, by the way. 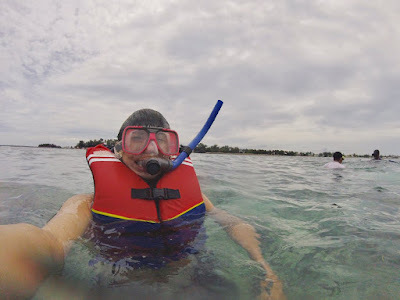 Sometimes in the afternoon, many of us are difficult to be productive in doing things. It's an afternoon, what are you hoping for? Laziness begins to spread to our soul and body. But don't worry, don't be panic, there is a solution named coffee. Soul-ution, actually. Afternoon is the second most perfect time to drink our coffee. Tired, weary, exhausted, all often happens on afternoon. 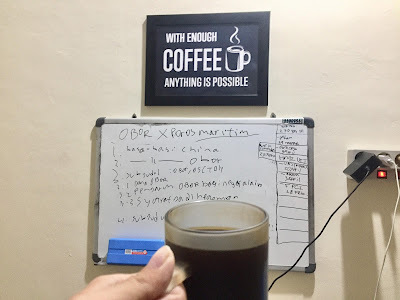 So, why not we fight those Laziness with coffee? Coffee and book is a good couple at night. To read a book, you need to consentrate, and coffee offers you that. 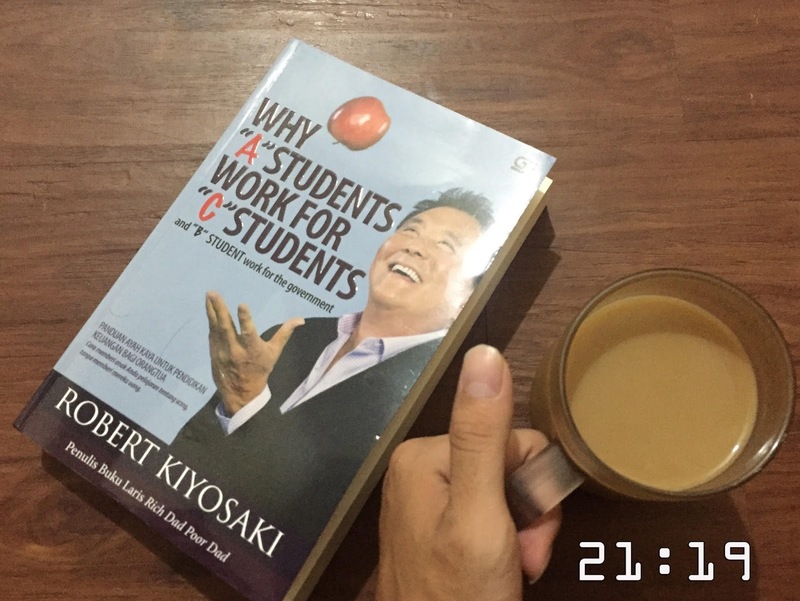 Actually it's kind of optional, but the past few days I always drink coffee at night while reading Kiyosaki's. By the way, 'Whay A Students Work for C Students' is a good book. It's just funny how Kiyosaki expose his view on why 'C' students could end up become capitalist while A student just becoming employee who pay the tax with the largest percentage. 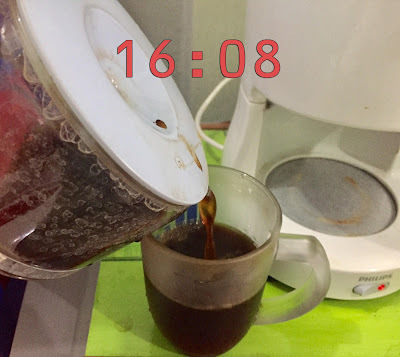 Actually it is out of topic, so let's go back to a cup of coffee before sleep. Could it be an anomaly? A cup of coffee before sleep could be just creating new problems for our sleep. But sometimes, cup of coffee at night can help us to solve the problem such as assignment which must be resolved soon. Sloving problem by creating problem, that's genius. I usually choose a bitter black hot coffee for morning and afternoon, but for the night I prefer the sachet. Just need to sets the heat on dispenser, without coffee maker as previously. So, is it normal to drink 90 coffees per month? Medically, I still dont know. But if we change that research question to is it fun to drink 90 coffees per month? I would like to answer the question with: yes, it is.